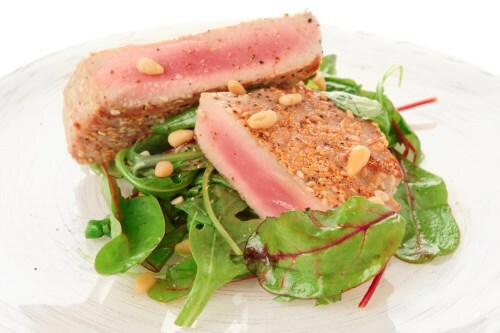 With a sharp knife, cut the tuna into 4 large pieces for appetizer portion, 2 large pieces for dinner portion. Use your judgment on what shape you want to cut your tuna because not all tuna is the same size or shape. However, the shape should somewhat resemble a miniature brick. Season the tuna pieces with salt and pepper. Coat lightly on all sides with almond meal. Heat extra virgin coconut oil in a large heavy skillet over high heat. The pan should be as hot as you can get it. Place the tuna in the pan, and sear on each side for about 45 seconds for small portions, or 1 minute for large. Remove from pan. The tuna will be very rare. Slice each ‘brick’ into 1/4 inch thick slices, and fan out on a serving plate. Enjoy plain, or with the condiments of your choice.